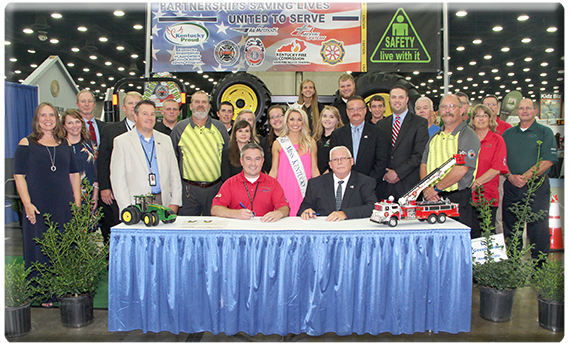 LOUISVILLE, Ky. — Officials with the Kentucky Department of Agriculture and the Kentucky Community and Technical College System/Kentucky Fire Commission today signed an agreement to work together to promote farm safety in Kentucky. The KDA will work to assist in recruitment of firefighters across the Commonwealth. The KCTCS/Fire Commission will serve as a resource for training in agricultural emergency responsiveness. The KCTCS/Fire Commission and KDA will assist fire departments in obtaining other resources such as personnel, funding, and equipment. The KCTCS/Fire Commission and KDA will be able to share equipment. The KCTCS/Fire Commission and KDA will work together to schedule farm rescue equipment usage. Representatives of the KCTCS/Fire Commission and KDA will appear together at state and local fairs, shows, and other available opportunities to promote farm safety and agricultural emergency response.